The Bonneville Power Adminstration is handing out extra cash in August for anglers who catch the juvenile salmon devouring northern pikeminnows. There will be weekly drawings of $1,000 prizes to 15 anglers who check in pikeminnows and fill out an entry card. The extra reward adds to cash incentives the BPA already pays for catches of northern pikeminnow, through the Northern Pikeminnow Sport Reward Fishery Program. The program has eliminated more than three-million pikeminnow from the Columbia and Snake rivers since 1991, reducing predation on salmon by 38 percent. "To date, anglers have caught more than 75,000 pikeminnow that would be eating young salmon right now," said Russell Porter, senior program manager, Pacific States Marine Fisheries Commission. "We hope these incentives attract more anglers who can have a little fun and help endangered species in the process." 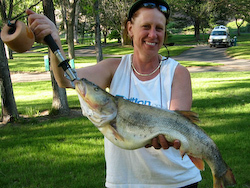 The more northern pikeminnow an angler catches, the more the fish are worth. The first 100 are worth $4 each; the next 300 are worth $5 each, and after 400 fish are caught and turned in, they are worth $8 each. As an added incentive, specially tagged fish are worth $500. Only fish caught from the Columbia mouth to Priest Rapids Dam, and form the Snake mouth to Hells Canyon Dam are eligible. Last year, excluding tagged fish, rewards totaled more than $1-million for 158,674 fish. A total of 167 tagged fish paid out $83,500. Last year, Nikolay N. Zaremskiy of Gresham, Ore., was paid $57,772 for catching 7,015 fish, and David R. Vasilchuk of Vancouver took second with $44,608 and 5,185 fish. The top-20 catches were paid a grand total of $430,415. Last year, anglers caught about 159,806 fish with 26,141 angler days spent on the water. The daily catch-per-angler average last season was 6.11 fish. Some of better catches occur from the The Dalles Boat Basin check station; Boyer Park in the Snake River below Lower Granite Dam; and the M. James Gleason ramp in the Lower Columbia River Washougal. The fish caught aren't just thrown away in the trash; they are used to make liquid organic fertilizer for agriculture and fish meal for poultry and dairy cattle feed. There are 17 check stations along both rivers. Anglers must register in person each day before fishing. Catches must be checked in at the station each day, and reward vouchers will be given. Details: 800-858-9015 or go to the Pikeminnow Reward Program Web site. The program is administered by the Pacific States Marine Fisheries Commission and is funded by the Bonneville Power Administration, which is directed by the 1980 Northwest Power Act to fund work to improve salmon runs harmed by federal hydroelectric dams.